When we think of slavery, most of us think of the American South. We think of chattel slavery, of back-breaking fieldwork, and of cruel and inhumane treatment on plantations. We don't think of slavery in the North, nor do we think of the grueling labor of urban and domestic/house slaves. 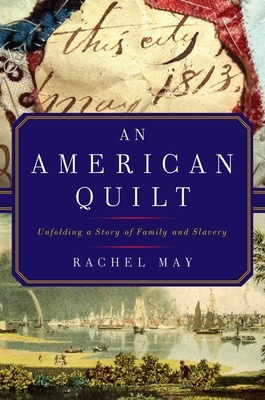 Rachel May's remarkable book explores the far reach of slavery, from New England to the Caribbean, the role it played in the growth of mercantile America, and the unbreakable bonds between the agrarian south and the industrial north in the antebellum era--all through the discovery of a remarkable quilt. While studying objects in a textile collection, May opened a box that held a treasure-trove: a carefully folded, unfinished quilt made of 1830s-era fabrics, its backing containing fragile, aged papers with the dates 1798, 1808, and 1813, the words "shuger," "rum," "casks," and "West Indies," repeated over and over, along with "friendship," "kindness," "government," and "incident." The quilt top sent her on a journey to piece together a story from archives that include hundreds of letters between the Crouch-Cushman families of Charleston, South Carolina and Providence, Rhode Island, as well as contracts, receipts, logbooks, and other ephemera. Stitches in Time is a beautifully written and resonant historical examination blended with personal narrative that takes this tactile connection to the past and stitches together an often silenced legacy of slavery by revealing the lives of Minerva, Eliza, Jane, and Juba--urban enslaved women--and their owner, Susan Crouch.